In the wake of Pearl Harbor, President Roosevelt called for the largest arms buildup in our nation's history. A shortage of steel, however, quickly slowed the program's momentum, and arms production fell dangerously behind schedule. The country needed scrap metal. Henry Doorly, publisher of the Omaha World-Herald, had the solution. 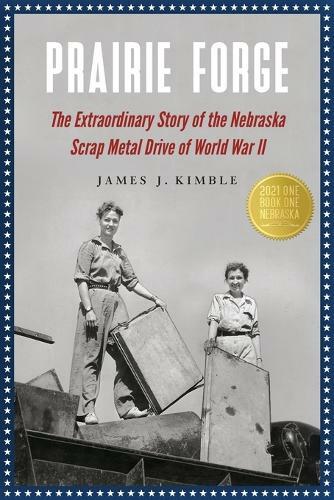 Prairie Forge tells the story of the great Nebraska scrap drive of 1942-a campaign that swept the nation and yielded five million tons of scrap metal, literally salvaging the war effort itself. James J. Kimble chronicles Doorly's conception of a fierce competition pitting county against county, business against business, and, in schools across the state, class against class-inspiring Nebraskans to gather 67,000 tons of scrap metal in only three weeks. This astounding feat provided the template for a national drive. A tale of plowshares turned into arms, Prairie Forge gives the first full account of how home became home front for so many civilians.